Today I’m going to talk about an important subject and how you can help out. Mental health is a very prominent issue which is not always addressed as seriously as it should be. We’re happy to sign a cast on a broken arm, and we’re quick to send a get well soon card when someone is diagnosed with a physical illness, so why as a society are we so reluctant to accept mental illness in this same manner? Luckily in Sheffield we have a fantastic service available to young people aged 13-25, called Door 43. Door 43 is a new project launched by Sheffield Futures to provide support to young people in need, in the hopes of counteracting the mental health time bomb which surrounds us. To fund the project they’ve launched Self Care Clothing. a clothing range to raise money and spark conversations. Sheffield Futures is located on Division Street in town and provides advice and guidance for young people. Youth workers are on hand and there are many opportunities such as NCS and Duke of Edinburgh which can improve young peoples CV’s. One of the services main tasks is to help get young people into the world of work. So more about Door 43, this is a service which offers emotional, mental and sexual health support for young people in Sheffield. It is a safe space where people can drop in and somebody will be available to speak to. 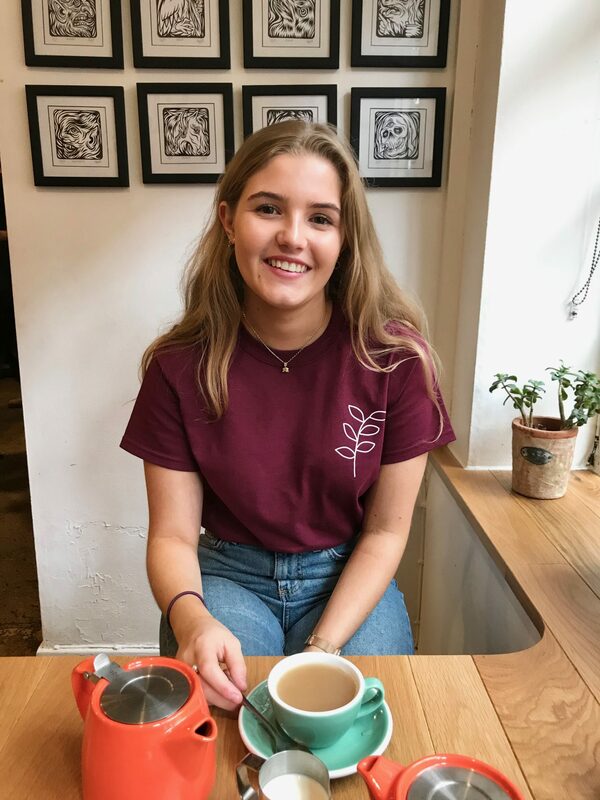 Door 43 is all about being a social space, they run a drop in cafe on a Tuesday between 5-7pm where a community has formed and young people can discuss important topics each week. It is a space where they feel valued and they can talk to like minded individuals about subjects which are bothering them. So as I mentioned, to help fund Door 43’s work they’ve launched Self Care Clothing. The young people who use the service had a final say in which designs were selected, which is just another way to get them involved. 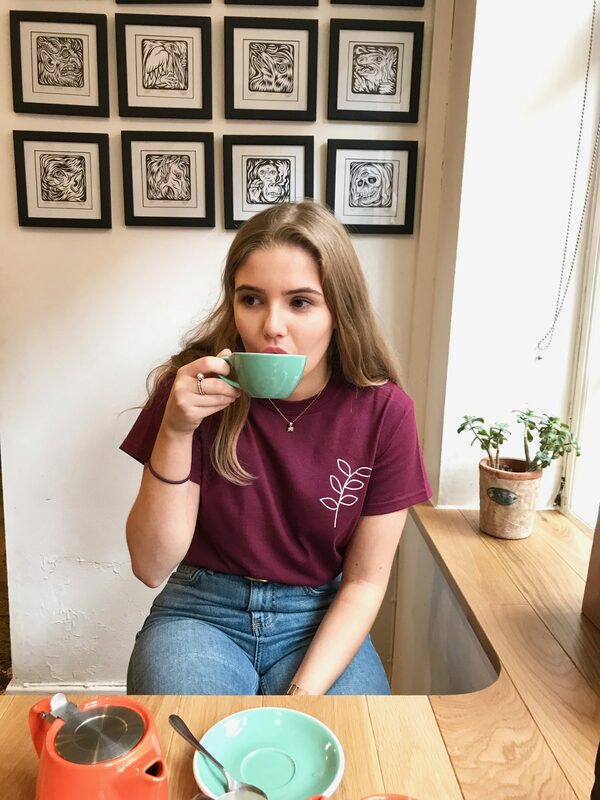 The clothing range includes hoodies, t-shirts and tote bags, available in black and burgundy and sporting either a heart or leaves. The clothing has even been worn by the Lord Mayor Magid Magid, so it’s already been a huge hit in Sheffield. I was kindly sent the burgundy leaf print t-shirt* which I can see myself getting a lot of wear out of. It fits really well and I love the message which came on the t-shirt. The message is a reminder to look after your mental health and to encourage self-care. 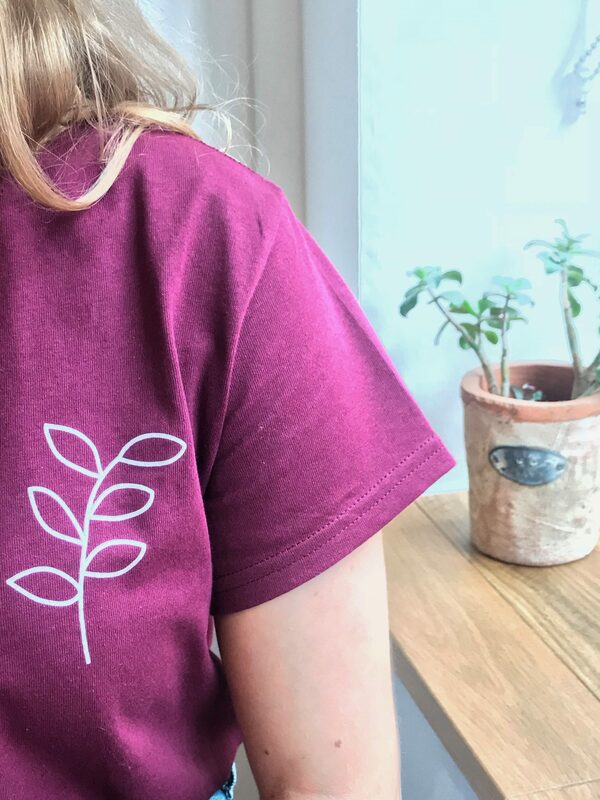 The clothing range is all about sparking that all important conversation about mental health and self-care. If somebody asks where my shirt is from it then gives me the opportunity to talk about Door 43 and ask how the other person is doing. Practicing self-care doesn’t just mean having a bath or lighting a candle. Self-care can be exercising, distancing yourself from toxic relationships, getting enough sleep or nourishing your social life with people who listen. Anything which will make you feel well physically and mentally is worth investing your time into. Good news for your guys, the t-shirts are currently on offer at just a tenner, so you can easily support a fantastic local cause. It’s great that we’ve got such an amazing service in Sheffield, especially given that we have two large universities. I’ve been to uni, had the stress and I know it can be bad, but for some people it really can get too much and develops into a mental health issue. Having a free drop-in service where there is access to youth workers, counsellors, substance misuse workers, sexual health workers, careers advisors, volunteers, peers supporters and more is so important. I am lucky to have a support network in Sheffield but for other people that is not the case, in these instances Door 43 can be invaluable. If you only take one thing from this blog post, remember that everybody can struggle at some point and it’s important to get help for yourself and to keep an eye on each other. Even one conversation could be so beneficial for somebody else feeling overwhelmed. Let me know what you think of the Self Care Clothing and the Door 43 service in the comments below. Also keep your eyes peeled for my interview with Tash Bright from Sheffield Futures in the latest issue of Exposed Magazine. *Door 43 sent me the t-shirt to help spread the word about this importune initiative. 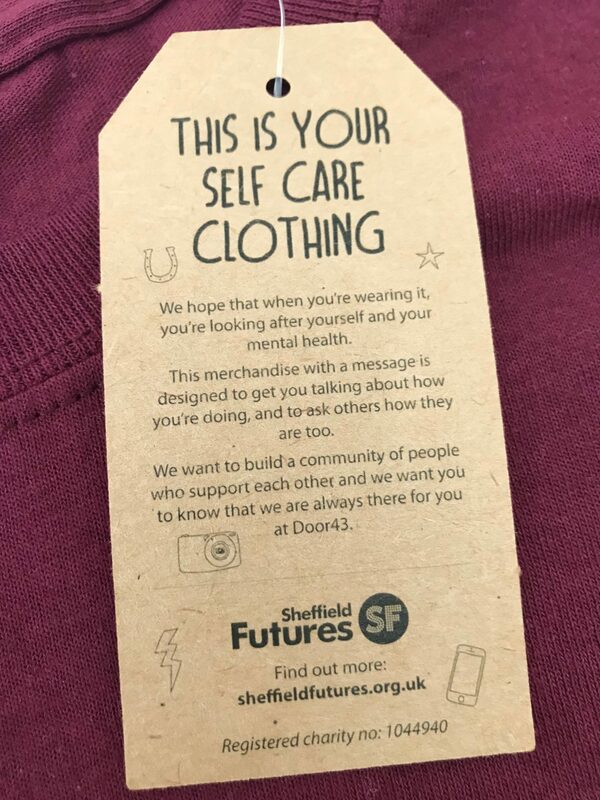 Self Care Clothing is available to purchase from Syd & Mallory and Devonshire Street in Sheffield or online. If you feel like Door 43 could help you, visit them at Star House on Division Street or call them on 0114 201 2800. This post appeared first on wanderinmeg.com. Lovely post Megan and for a great cause. Mental health needs to be talked about more. It’s great isn’t it! It feels good quality and it’s been washed and still looks the same! Yes they’re usually a bit more but they’re on offer at £10 so deffo worth grabbing one while they’re a bargain!